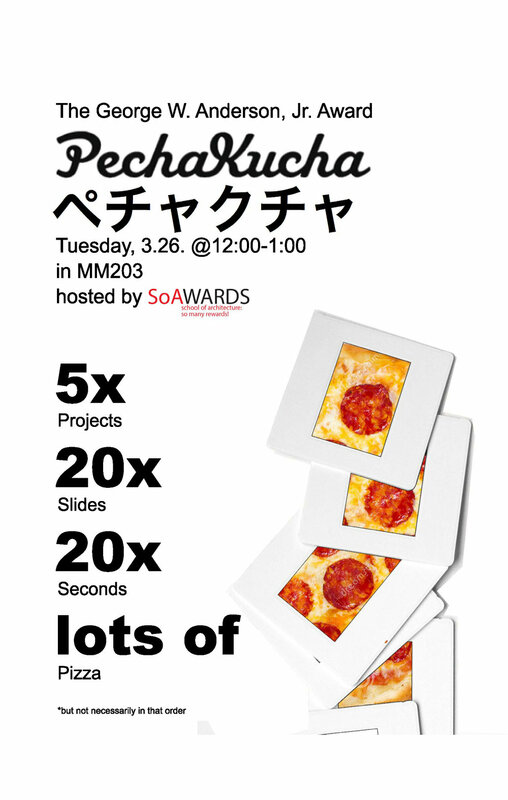 The School of Architecture invites you to join us as the finalists of the George W. Anderson, Jr. Award present Pecha Kucha presentations of their work to fellow graduate students and the review team during a lunch event on Tuesday, 26 March 2019 from 12:00-1:00pm in MMCH 203. From the applications submitted, a jury consisting of graduate program track chairs selects a shortlist of six candidates to present their Pecha Kucha presentation. It is anticipated that a 1st place award in the amount of $3,000 and a 2nd place award in the amount of $2,000 will be awarded. Visit the Anderson Award page to learn more about the award.